Throughout spring, our team has been busy creating a visitor-friendly front door. In the past, those unfamiliar with our vast campus may have stumbled upon one of our low-profile, inconspicuous map stands complete with a sun-bleached, microscopic index of destinations…or they’d have to resort to waving down a native for directions. 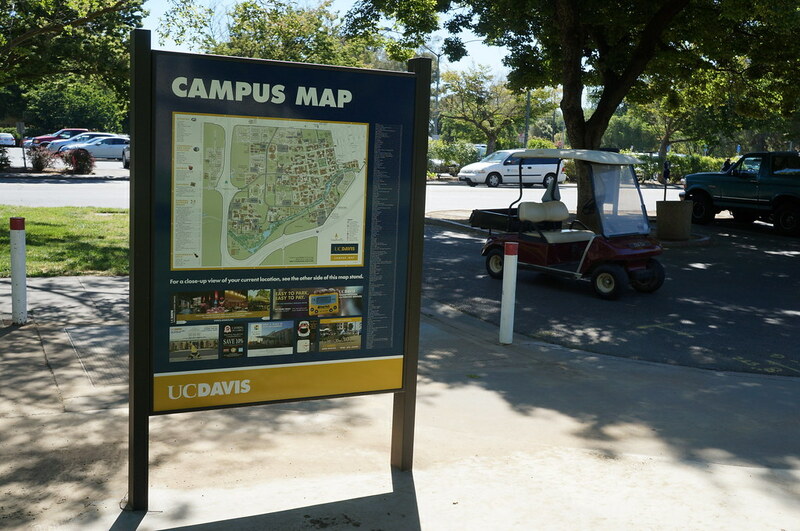 Now they’ll see one of the dozen or so extra large maps sprinkled throughout major campus entry-points and visitor parking lots. How can we afford this project? Credit goes to UC Davis Conference and Event Services staff. They are helping the campus tackle the cost and upkeep of our new outdoor map stands by engaging in multiple partnerships with local businesses that have purchased advertisements on these maps as well as the smaller print versions distributed throughout campus every year. READ MORE about the evolution of this project and other wayfinding projects. Wayfinding and sign aficionados, check out our GALLERY OF PHOTOS showing of the location of many of our new map stands.